@ENBSports (Aaron Nielsen): RNO: How far is MLS from its goals for 2022? RNO: How far is MLS from its goals for 2022? How far is MLS from its goals for 2022? This past weekend I had the chance to join fellow RNO writer Kamal Hylton on his new podcast The Gaffer and Hooligan. I hope to join Kamal on future podcasts as I think the concept is very interesting and useful in giving the Canadian perspective on soccer with regards to MLS and CONCACAF. His first episode was of course dominated by the MLS Cup Final and the recent World Cup draw; two events in the soccer calendar that should be celebrated, which was certainly echoed in the podcast. However, I thought two interesting debating points were brought up, first the quality of MLS and second should MLS be regarded and accept the role as a feeder league? I think MLS should be pleased with their final. It was an exciting game that included plenty of action: 36 shots, 40 fouls, 29 crosses, a penalty shootout that went ten players deep, and played at a relatively fast pace. You could compare the game in the global soccer landscape to a local derby or a classic late season “6 pointer” game, where each team puts in a huge amount of effort and never gives up. Arguably it could also be regarded as one of the best MLS games this year, which is rare for most soccer seasons, as usually the tension of the final tends to prevent players playing to their full potential. Aside from this, however, is the reality that if this is the best the MLS has to offer I think it brings up some concerns for the future, especially if we wish to believe the MLS objective of being comparable to the top leagues in the world by 2022. The game was chippy, of the 36 shots only seven were on target, including a few misses that showcased the league's lack of quality. Even tactically, both teams were playing for the ugly goal with Kansas City crossing at every opportunity and both teams pressing to force the other team into a mistake. Outside of Beckerman’s opening assist and a Morales' missed chip, other acts of skill weren't going have influence on the game, which you expect from soccer played at a high level. There were factors why this was the case. First, the weather didn't help, and if the league is seriously considering a winter schedule just imagine two teams playing in these conditions when nothing is on the line. The second argument is that Sporting Kansas City and Real Salt Lake are two small market clubs and they don't have the stars that a LA, New York or Seattle has. This is true, although under the current system there is a reason why Sporting Kansas City and Real Salt Lake made the finals - based on depth these two clubs have the most fully developed rosters of any team in the league. Which brings up the question of how does MLS compare to other leagues in the world and how can they improve to reach a comparable level to the top leagues in the World? The answer is difficult because MLS isn't really comparable to many leagues around the globe. It is certainly not at the skill level of the big five leagues in the world and I don't think Sporting Kansas City could compete with any teams currently playing in the UEFA Champions League. MLS is comparable with some leagues in terms of being top heavy in talent like Russia, Ukraine, China, the Middle East, and Mexico, although these leagues are far more active than MLS in the transfer market and if they sell a player to a larger league, it’s been for a substantial transfer fee. I could argue talent-wise, MLS is comparable to Japan and Australia or European feeder leagues such as Denmark, Sweden, Norway and Scotland, although these leagues don't talk about competing with the top leagues in the world. To be honest, outside of Australia, for a player, I would say these leagues are better than what the MLS currently has to offer. So quality-wise you are looking at a collection of players who would struggle for jobs in most 1st divisions in the world, and as a collective unit would be at the bottom of most league tables or in a lower division. The irony is despite the lower quality of play, revenue-wise MLS is better than most leagues in the world. Seattle Sounders 42,963 attendance per game, $175 Million dollars in value and $18.1 million dollars in yearly profit is comparable with any soccer team. In a hypothetical environment, if you put all MLS clubs current value based on attendance, revenue and potential, within the English Football League, arguably five or six clubs would be consistent Premier League teams and the rest would be in between relegation and promotion. The smallest market team in MLS would compare to a Leeds or Sheffield in England in terms of revenue verse expected performance. 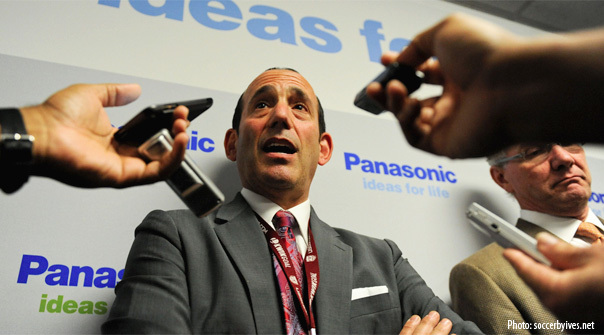 The question now becomes how does the MLS transforms revenue potential into quality of play? First off, I don't think you become a feeder league. Given the chance, the feeder leagues around the world would choose not to be, and they are mostly feeder leagues because financially they can't afford the value of the players they produce, so it’s good business to sell. Although this is not always the case, as in many instances it’s difficult to continue to produce players of this skill level and in Europe many clubs in the long run have lost money through gate revenue by selling a player, including some clubs being relegated and never achieving top level again. MLS clubs should not feel they’re in this position and instead concentrate on long term development and providing the best quality of talent each week. Which based on the traditional model of soccer, is a huge luxury since most clubs just deal with either winning, surviving or selling on to maintain their current position in the football world, and mistakes could see the team relegated or in bankruptcy. This also means that MLS doesn't have to be in the market for high priced talent since the need is different. Sure a Jermaine Defoe might sell a few more tickets, but MLS doesn’t need Defoe to score goals and instead they can concentrate on the players who will produce the same results on the pitch as Defoe for 1/10 of the salary. In the MLS Cup Final, the best players were Salt Lake’s Beckerman and Morales and Sporting KC’s Zusi and Collin. Players who are rewarded well salary-wise in the MLS in the $250,000 range, but due to age, awareness and skill would probably be a Free on the transfer market and be valued at less than $500,000. In the top five leagues these types of players would be cut or loaned out to a lower league because a top five league would have a $2,000,000 valued player competing for those positions. Doing statistics for over 60 leagues worldwide, I come across a number of players who fit this mold and are mostly ignored by the football world. A great example would be Southampton striker Rickie Lambert who played a number of seasons in League 1 and League 2 scoring a huge amount of goals, although it wasn't until the Saints got promoted to the EPL that most people knew who he was. Although ambitious, I do feel there are opportunities for the league to succeed on their goal of better quality, however, I’m fearful it’s just a marketing ploy. Much like when MLS started in 1996 as a legacy to the 1994 USA World Cup, and at the time one of the main pitches was that in twenty years the United States could win the World Cup. Close to twenty years later United States isn't any closer and based on the current draw could finish last in their group in 2014. It was easier in 1996 to make far reaching comments, but now American fans watch global soccer more regularly. While there is nothing better than attending a game live, people will begin to question why they are paying the same prices for tickets as elsewhere, yet not receiving the same quality product. This could be the league’s most difficult campaign yet and hopefully more knowledgeable fans of the league like Kamal Hylton, and his new podcast, will hold them accountable.